This one's for the many folks who come here via a Google search for "Adventures in Homebrewing Ann Arbor" or, in some cases, "When the hell homebrewing store ann arbor open." Official word from Jason and Tyler continues to be "no comment." They are in the final inspection process, but unwilling to hazard a guess as to when that green light will finally go on. Exact words were "I hope next week... only time will tell." The wheels of bureaucracy turn slow, or something. In the meantime, to quote a great philosopher: "Relax, don't worry, have a homebrew." 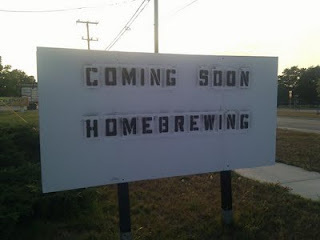 UPDATE 8/5/11: Ann Arbor homebrewers, rejoice! Straight from the horse's mouth, the official word is that Adventures in Homebrewing West will open next Saturday, August 13. Hours are M-F 10am - 7pm, Sat 10am - 5pm, closed Sunday (for now anyway). Grand opening party planned for Saturday, September 17, so mark your calendars. And follow the latest developments at the Adventures in Homebrewing Facebook page.